I was so happy to be part of a Secret Santa gift exchange this year! It's my first one I've ever been a part of among the blogger rings, and it was a lot of fun sharing this with some of my favorite petite fashion bloggers. The idea was brought up on the Alterations Needed forum which is a great community of petite ladies who love talking about how their new purchases fit. Anyone who is 5'4" or under knows how invaluable this can be! My Secret Santa ended up being Megan from the AN forums, who doesn't have a blog but she does hail all the way from Australia. If you follow my twitter you will know that I was totally stumped about a random package from Oregon without a return name and lo and behold, Megan had gotten a friend to send me my gift from the US! 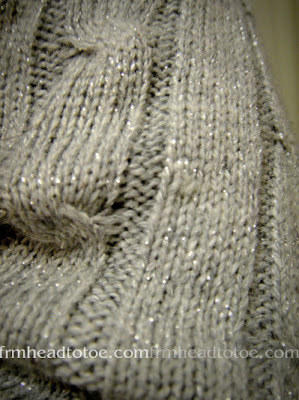 It's the LOFT Petite Metallic Cable Sweater! I had been eyeing this sweater lately since my closet is rather slim on the "cable knit sweater" category of winter-wear this year. It's lovely and so warm! Here is the stock image. Isn't the model so pretty? I pretty much want every item she models. Haha. 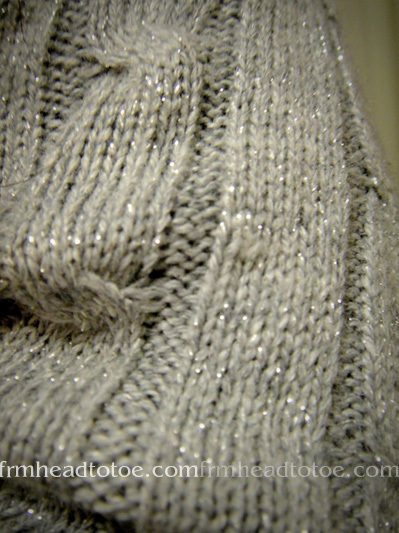 Here's a close-up so you can see the little metallic threads woven into the sweater. It's quite shimmery in real life. I <3 my layers! 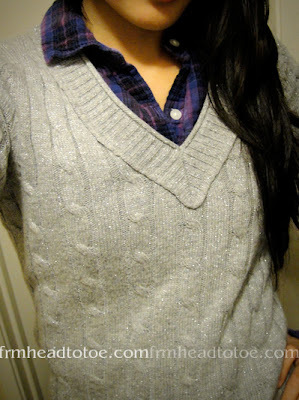 It's so preppy to put flannel under a cable-knit. I love it! The sweater is currently on promotion for 50% off so I do recommend snagging it if you can. The sleeves are nice and slim but the torso is loose enough to layer comfortably underneath. The fabric breakdown of the one I received is 16% Cotton, 16% Nylon, 22% Wool, 5% Rabbit Hair, 41% Rayon so it's hand wash only but if you are averse to hand-washing, there is also the exact same version of this sweater in all cotton here at LOFT as well. Thank you so much ladies! I had a fabulous time exchanging presents with ladies who are so tuned into what the others would love or want. It's actually really, really impressive. :D Hope we can do another one next year! Thanks for participating, Jen! Can't wait til next year. : ) Have a fun, safe, and happy new year! I never liked Barbie as a kid, but if they had this around back then, I would have gone NUTS. Wow, Megan was so sneaky about the gift that it came from Oregon! =) The sweater fits you so well and it's perfect for the season! Oh that sweater looks great on you! Just the right amount of sparkle to it. Beautiful outfit, sweetie!! :) You look absolutely stunning! HAPPY NEW YEAR!! Very sneaky of Megan indeed! We were wondering who this mysterious sweater from Oregon came from. Tiny petites seem to fare well in LOFT XXSP sweaters...hope you'll get a lot of wear out of this winter. Have always been a fan of your YouTube tutorials and have recently started reading your blog, too. That's such a great idea! And it's kinda funny, I've never considered myself petite but after seeing your description I guess I am. Thank you Jen! All your tips are super helpful! I have no idea how I missed this post!!! Grrr...to google reader!!! It was super fun! Can't wait for next year!